A case study on the actual water treatment process during Hydrodemolition work clearly shows the benefits of using the Ecoclear to treat the blast water. The report is issued by an accredited laboratory, Njudung Energy, in Sweden. Step one – the clear inlet water to the high-pressure pump (tap water). Step two – the blast water. Step three – the treated water leaving the Ecoclear. The results of the report show the efficiency of the Ecoclear’s water treatment capacity. It also shows that the Ecoclear system both works as water treatment system that removes the solids from the blast water and neutralizes the pH of the water. However, as shown by the conductivity numbers, it also works as water softner. The most common Ultra High-Pressure pumps on the market has an allowed water conductivity range between 300 to 1000 µs/cm. The treated water from the Ecoclear is well within that range. The recirculution process, from the Aqua Power Pack – to the Aqua Cutter robot – to the Ecoclear – and back to the Aqua Power Pack, is only possible with the Ecoclear system. Up to 90% of the water can be collected and recirculated which means less water consumption and more money in the bank. The EcoClear water treatment system is a state-of-the-art solution dedicated to treat Hydrodemolition water at a completely new level. 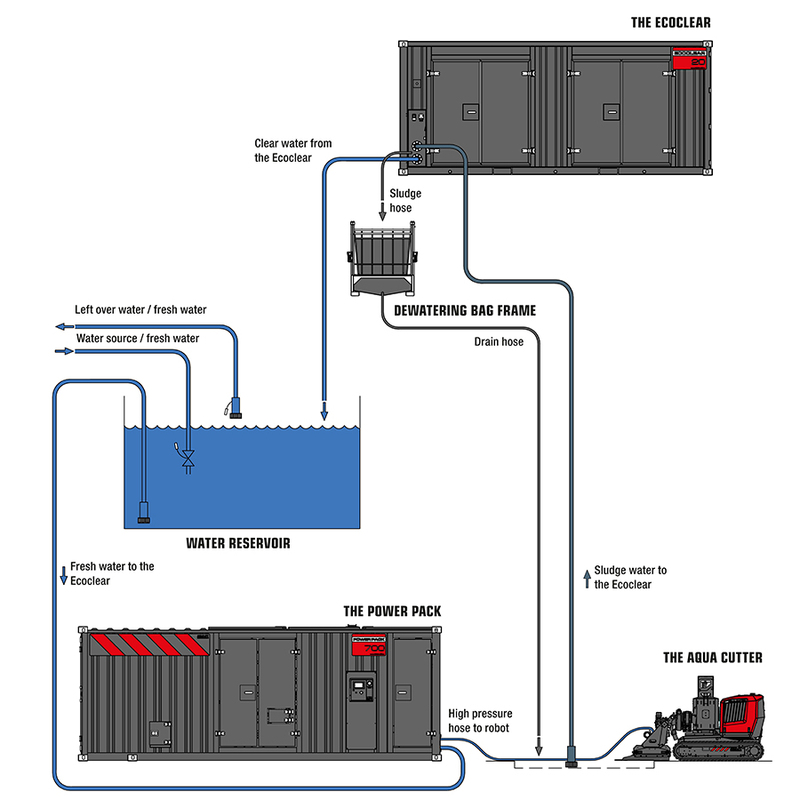 EcoClear enables the operator to safely discharge water back into the environment – without the need for an extra water reservoir, without the use of filters of any kind – and without any pollution. As shown above, it can also successfully be used to recirculate the water in the Hydrodemolition process, making the work both more cost effective and also more environmentally friendly. The EcoClear is designed to work perfectly with our range of AQUA CUTTER robots. It’s capable of handling an impressive flow rate up 20 cubic meters per hour. With EcoClear you can neutralize elevated alkaline pH levels down to pH 6-9 while you have full control of the turbidity level down to 10-20 mg particles/liter.